If you're a musician, a journalist, or a videographer, you can put a handheld recorder to very good use. By buying this product you'll earn up to 280 Rewards points. If you're a musician, a journalist, or a videographer, you can put a handheld recorder to very good use. 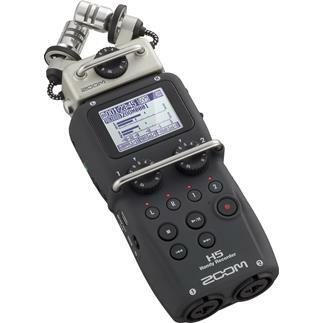 Recording your band's rehearsal or an interview for a radio show or podcast is as easy as pressing a button with the Zoom H5 Handy digital recorder. The shock-mounted stereo condenser mics capture clear, detailed recordings up to a whopping 140 dB SPL. Additionally, there are inputs for other types of mics, like a 1/8" input for a lapel mic, or an XLR input for a dynamic or condenser handheld or stand-mounted mic. 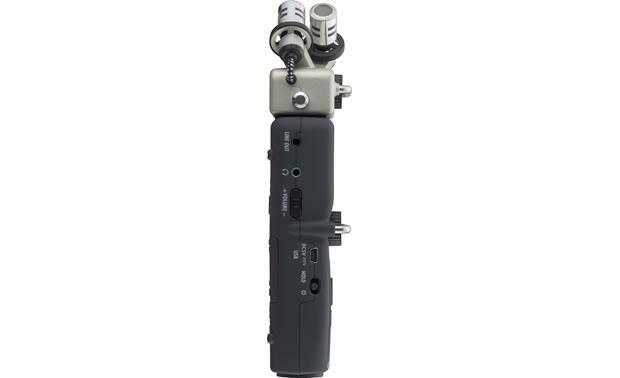 Plus, you can even remove the H5's microphone capsule and replace it with a shotgun mic or XLR/TRS input capsule. 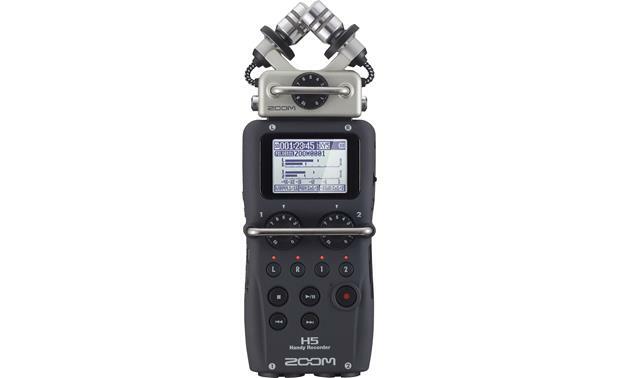 The H5 recorder has built-in stereo mics as well as combination XLR/TRS inputs for external microphones or line-level sources. 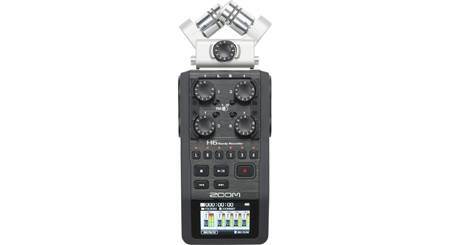 Though compact and streamlined, this recorder has some very cool advanced features. You can set it to automatically record when sound is detected, or use the pre-record function to capture the previous couple of seconds before you actually hit the record button. Worried that high input levels could ruin an otherwise pristine recording? Enable backup recording and the H5 will capture a "safety" recording at lower input levels. Record up to 4 tracks simultaneously or overdub onto previously recorded tracks. You can add effects like compression and a low-cut filter, mix down to stereo, and create finished files in lossy MP3, CD-quality lossless, or high-resolution WAV. And you can do it with the H5's simple interface and LCD display. There are several ways to review and monitor your recordings with the H5. There's a small built-in speaker, as well as a headphone output. 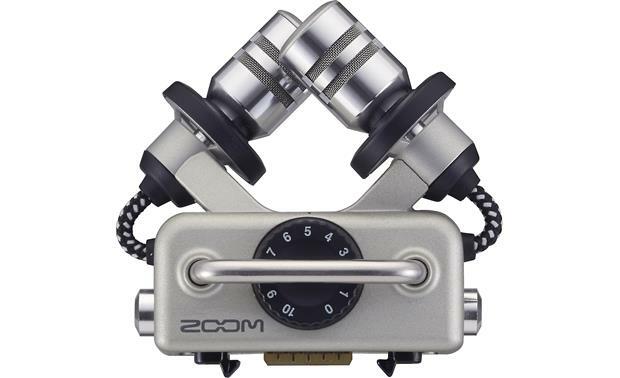 In addition, the line out is perfect for sending audio out to a DSLR camera for high-quality audio recording to accompany video. WAV file recordings are broadcast-compliant and time-stamped for easy syncing with video in post-production. There's also a threaded insert for connecting the H5 to a tripod or to your camera with an optional hot shoe mount. If you want to expand the H5's audio editing capabilities, you can connect it to your computer via USB. Install the included Steinberg Wavelab LE software on your computer, and you'll be able to take advantage of the H5's advanced editing and mastering features. If you have your own digital audio workstation software on your computer or iPad®, you can use the H5 as an audio interface to record multitrack music and create polished, professional-sounding songs. You can connect microphones or line-level instruments like keyboards or a guitar via direct box to the combination XLR/TRS inputs on the bottom of the recorder. Requires Apple's Camera Connection Kit, not included, for use with iPad. The H5 is solidly built, so you won't be afraid to take it out in the field or to your next gig. It has real gain knobs for the built-in mics and two XLR inputs. The sturdy knobs are further protected by clever roll-bars, to ensure they don't get accidentally damaged or knocked off while the recorder is in your bag. The H5 also comes with a protective case for portable use. 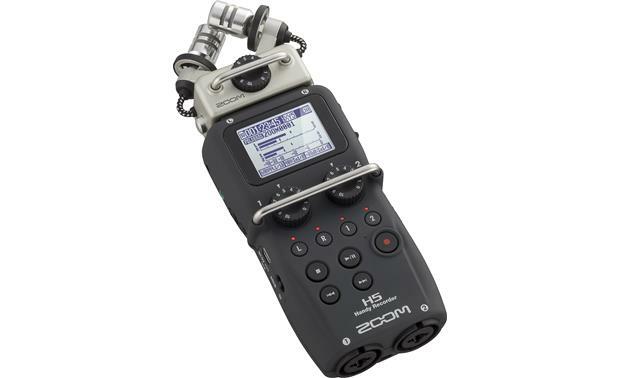 Overview: The Zoom H5 Handy Recorder is a portable 4-track digital audio recorder with an interchangeable mic system, a stereo mic/line input, and two XLR/TRS combo jacks. The H5 can record in either WAV or MP3 formats onto an SD memory card. A 1.9" backlit LCD screen (128 x 64 dots) shows the input levels of all four tracks, and lets you maneuver through the menu with ease. The unit comes with a foam windscreen, a 2 GB memory card, a USB cable, and two "AA" alkaline batteries. The entire kit stores safely in the supplied hard plastic carrying case. 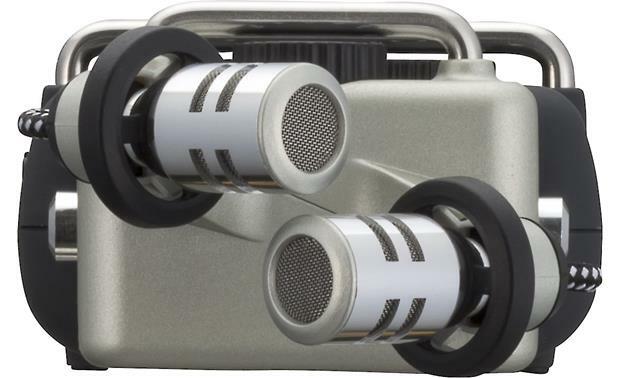 Interchangeable Microphones (L/R Input): The H5 comes with the XYH-5 XY Stereo Microphone capsule attached to the top, with two unidirectional condenser microphones in an X/Y configuration (facing each other at a 90° angle). The microphones use an integrated shock mount to minimize noise from external vibrations, and can handle sounds up to 140dB SPL. In addition, a stereo 3.5mm input lets you connect an external microphone or line-level source instead. A rotary Input Volume control lets you change the level of the L/R input. 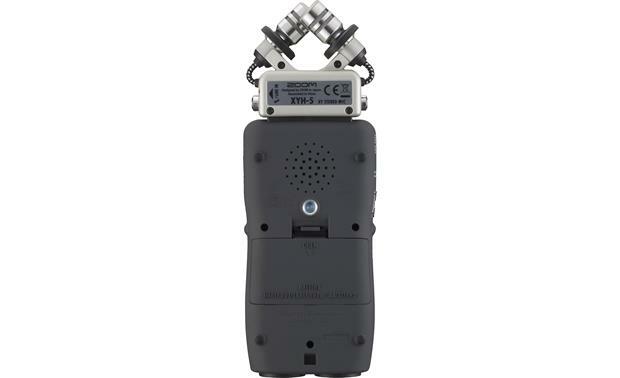 You can remove the XYH-5 capsule and attach other optional capsules, such as the SGH-6 Shotgun Mic, EXH-6 Dual XLR/TRS Combo, XYH-6 X/Y Mic, or the MSH-6 Mid-Side Mic. XLR/TRS Combo (1/2 Input): On the bottom of the H5 are two combo connectors that can accept either XLR or TRS balanced or unbalanced 1/4" cables. The connectors use the industry standard "Pin 2 hot" (XLR) or "Tip hot" (TRS) protocol on the connectors. The inputs can handle both mic-level and line-level signals with ease, with internal switching contacts automatically detecting the signal type. If you are using high-quality condenser (powered) microphones, a simple menu option provides Phantom Power (+12V/+24V/+48V) to the Inputs 1/2. Two rotary volume controls below the H5's display allow you to independently set the levels for Input 1 and 2. Outputs: The H5 features a 3.5mm unbalanced line output, located on the side of the recorder for sending a stereo signal to a camcorder, digital camera, or other device. Below that, a 3.5mm headphone jack with a dedicated volume control on the side lets you monitor your recordings in real time, or privately listen to playback. A Mini-B USB port (2.0 Full Speed compatible) provides a digital output in stereo mix or multi track to a computer or iPad. WAV: WAV files are uncompressed. In Stereo Mode, the H5 can record in any of three sampling rates (44.1kHz, 48kHz, 96kHz) and two bit depths (16-bit, 24-bit). (In 4CH mode, only 44.1kHz/16-bit, 44.1kHz/24-bit, 48kHz/16-bit, 48kHz/24-bit are available.) WAV files are automatically time-stamped, making them compliant with the Broadcast Wave Format (BWF). This allows you to precisely synchronize the audio with on-screen action in video post production. MP3: MP3 files are compressed to reduce file size, making them easier to store, upload and download. You can record only stereo files in MP3. Available bit rates for recording MP3 include: 48kbps, 56kbps, 64kbps, 80kbps, 96kbps, 112kbps, 128kbps, 160kbps, 192kbps, 224kbps, 256kbps, 320kbps or VBR (variable bit rate). Multi File: In Multi File mode, the L/R inputs from the XY mic (or other input capsule) are recorded to the L/R tracks, and Inputs 1/2 are recorded to tracks 1/2 as separate files. The signals are recorded to separate files allowing you to adjust the playback volumes and positions independently after recording. You can only record at 44.1/48kHz WAV formats can be selected in Multi File mode. Stereo: In Stereo mode, the L/R inputs from the XY mic (or other input capsule) and Inputs 1/2 are recorded together as a single stereo file. You can freely choose the recording format to suit your needs. This mode records the highest audio quality and result in smaller files. Recording Media: The H5 Handy Recorder records audio directly to SD and SDHC memory cards up to 32 GB. A 2 GB MicroSD card with an SD card adapter is included with the recorder. Audio Interface: The H5 will allow you to send signals input through the recorder directly to a computer or iPad. You can also output signals from that device through the H5. You can set it up as Stereo for a 2-in/2-out interface, or Multitrack for a 4-in/2-out interface. An iPad can only be used in stereo mode. Power Requirements: The H5 is powered by two "AA" alkaline batteries (supplied). You can also use Ni-MH rechargeable batteries. Battery life with alkaline batteries in Stereo File mode (XY mic, 44.1kHz/16-bit stereo x 1) is about 15 hours. 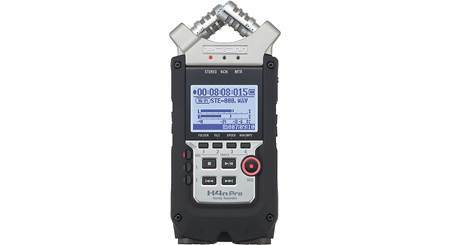 In the Multi File mode, (XY mic, Inputs 1 and 2, 48kHz/24-bit stereo x 2), battery life is about 7 hours 10 minutes. You can also operate the recorder on USB bus power or an optional AC adapter (AD-17). Mounting Options: The H5 has a 1/4" threaded tripod mount that allows you to place the recorder on a tripod or other mount with a 1/4" screw. With an optional hot shoe adapter (HS-01), you can mount the recorder to the top of a DSLR or shoe-equipped camcorder. You can also mount the recorder to a microphone stand with the optional MA2 mic stand adapter. Optional Remote Control: The Zoom H5 can be operated from a distance by using the optional RCH-5 Remote Control (found in the H5 Accessory Pack). The remote connects to the remote port on the side of the H5. With the remote control, you can start and stop recording and playback, skip to previous and next tracks, select the inputs, and adjust the volume. Auto-Record: The H5 can detect when the input level surpasses your pre-determined level, and can automatically start recording from the recording standby position. You can independently set a start level and a stop level. Likewise, you can set the recorder to stop recording automatically once the input level goes below a pre-determined level. Pre-Record: When Pre-Record is engaged, the H5 will continuously record in the background while you wait for an event to begin. When you hit the Record button, the recorder keeps the previous two seconds and adds it to the beginning of the file. Pre Count: You can set the H5 to begin recording after a count in. The count can be set to 1 to 8 or Special. Backup Recording: When using the L/R input, in addition to recording at the set input level, the recorder can also record a separate file at a level 12dB below. This backup recording can be used if the recording level was set too high, causing distortion. Overdubbing: You can add recordings later to an already recorded project. This can only be done when recording in the Multi File mode with 44.1/48kHz WAV files only. Track Marks: You can place up to 99 track marks in a file to mark specific portions of the track to easily locate that part of the track later. Low-Cut Filter: The Low-cut filter can be used to reduce the effect of wind noise and vocal pops on your recording. You can select the inputs to apply the filter (L/R, Input 1, Input 2, All), and the cutoff frequency (80Hz, 98Hz, or 115Hz). Compressor/Limiter: The Compressor/Limiter can help adjust the input signals to optimum levels. The compressor reduces high levels and boosts low levels. You can choose a standard compressor, or one for vocals or drums. The limiter reduces the levels when input signals exceed a set level. You can choose a standard limiter, or one for live performances or studio recording. Input Pad: When you're connecting a mixer with a standard output level of +4dB, you can set the H5 to reduce the signal level by -20dB. Variable Pitch/Playback Speed: You can adjust the playback speed in a range from 50% to 150% of normal, in increments of 5%, without changing the pitch. In addition, you can raise and lower the pitch of the playback without effecting the playback speed. AB Repeat: The AB Repeat function allows you to continuously and repeatedly play back a portion of the track. You can set marks at the beginning and ending of the desired portion. Editing Tracks: You can perform editing functions on projects or individual tracks. These functions include renaming the file, add voice memos to a project, divide a project or file into two, and trim unnecessary beginnings and endings of recorded projects. To create space on the memory card, you can delete individual or multiple files and projects. Tuners: The recorder can be used as a standard chromatic tuner to help keep everyone in tune. In addition to chromatic, there are other tuning modes such as guitar, bass, and Open A. The tuner can be calibrated between 435 Hz to 445 Hz in 1 Hz intervals. The input source can come from the microphone or the line input. Metronome: The built-in metronome provides audible cues to help you set and keep the tempo. The metronome can provide a pre-count of 1 to 8 beats, or a special pre-count. The tempo can be set between 40 and 250 beats per minute by 0.1 bpm. You can also adjust the level (0-10), pattern (0/4--no accent, 1/4 to 8/4, and 6/8 time signatures), and sound (bell, click, stick, cowbell, or Hi-Q). Downloadable Software: The H5 is bundled with free software from Steinberg. You can download Cubase LE7 Music Production Software and Wavelab LE8 Audio Editing and Monitoring Software. Both programs are compatible with Windows 7 and 8 and Mac OS X 10.7, 10.8, and 10.9. 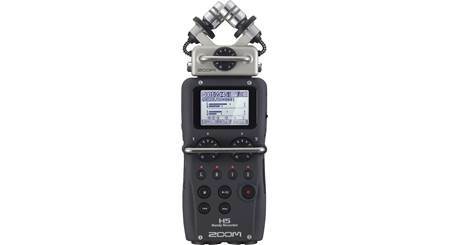 Searches related to the Zoom H5 Handy Handheld 4-track digital recorder.